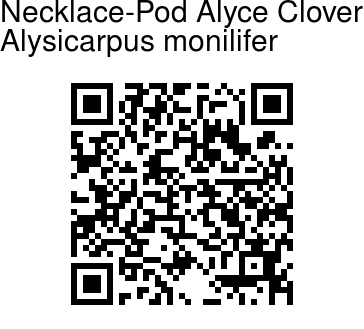 Necklace-Pod Alyce Clover is a spreading or prostrate much branched herb. Branchlets have elongate, spreading, pilose hairs. Leaves are 0.8-2.5 x 0.5-1 cm, broadly oblong or elliptic-oblong, base somewhat heart-shaped. tip blunt or rounded, mucronate, hairless or sparsely hairy. Leaf-stalks are 3-6 mm long, stipules 3-5 mm long, lanceshaped, channelled. Flowers are borne close in axillary racemes. Flower-stalks are up to 2 mm long. Sepal-tube is longer than the first joint of the pod; sepals lanceshaped, ciliate. Flowers are pink to violet, standard up to 5 x 2 mm, wings to 4 x 2 mm, keels to 6 mm long. 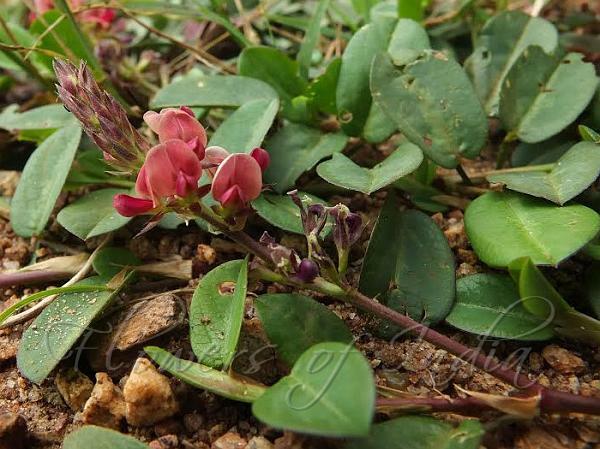 Pods are 3-7-jointed, 1.2-2 cm long, necklace-like, turgid, with hooked hairs.Necklace-Pod Alyce Clover is found in India, Pakistan and Ethiopia. Identification credit: Siddarth Machado Photographed in Banglore, Karnataka.